From Zero to Highly Strained in 45 Minutes! Happy New Year from New Reactions! 2013 brings another year of methodology blogging! It’s hard to believe that I started blogging two years ago this month. It most certainly has been one of my best decisions and I plan to continue doing it for a long time to come. After returning to lab this week, I have really begun cranking on some new projects in addition to finishing up two others. My hope would be to publish 3-4 research papers this year if possible. I just recently finished two review articles which should be published soon (one next month and one by the end of March). I’ll be sure to link them on NR once they are up. I am working closely with some of our undergrads as well (yes they do chemistry over winter break!) to hopefully get them on some papers. Additionally, we met with Professor Tilley yesterday as part of our collaboration with him (which is near completion!). I hope to send one of our excellent undergrads to work with him this summer. Considering it has been little over a week since my last post (with a holiday there in between), I had a much smaller selection of new articles to choose from for this post. But in a way that was a good thing because I would have missed today’s article. While I do appreciate the need for chiral methodologies and high ees, they aren’t my cup of tea. I get excited for interesting, new transformations (especially those involving fluorine, but that’s beside the point). So I nearly skipped reading this new article from Davies at Emory because it started with “Enantioselective Synthesis of…”. However, the [1.1.0] managed to catch my attention. They are making bicyclobutanes! As you may already know, in addition to organofluorine chemistry, I loved strained systems. My undergrad research was focused on preparing bicyclobutanes so they always have a warm place in my heart. I was even more ecstatic when I found out that Davies cited my bicyclobutane paper! Both mechanisms are quite plausible. 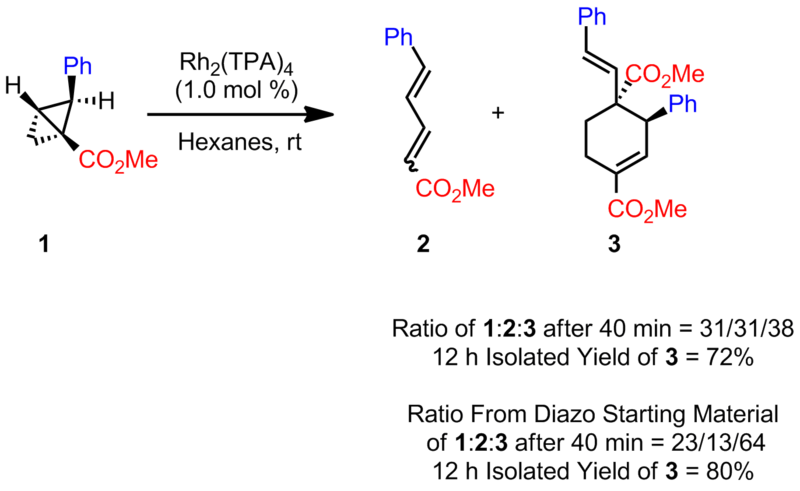 Later exploratory studies found that the bicyclobutanes could be obtained using Rh2(TPA)4 if ultra-low catalyst loadings were used in addition to short reaction times. However, both the cyclohexene and the diene were still being formed. Switching to Rh2(OAc)4, which is only slightly soluble in their reaction solvent (DCM), they were able to substantially improve selectivity towards bicyclobutane formation. Apparently this rhodium species does not catalyze the rearrangement to the diene/cyclohexene as readily and hence by using even shorter reaction times, strictly the bicyclobutane can be isolated. This catalyst gave excellent diastereoselectivity but no enantioselectivity. Since Davies is interested in asymmetric transforms, chiral dirhodium catalysts were explored to facilitate an enantioselective cyclization. After some careful study, Rh2(R-BTPCP)4 was found to be the optimal catalyst. Using this catalyst, 9 bicylobutyl derivatives were prepared in moderate to excellent e.r. Davies did not forget about his cyclohexenes however. Using high loadings of Rh2(TPA)4 and longer reaction times, he showed that a variety of highly substituted cyclohexenes could be prepared. Finally, with bicyclobutanes in hand, Davies sough to address the mechanistic question of which of the two pathways is operative. Using Rh2(TPA)4, at short reaction times (40 minutes), he showed that a mix of products could be obtained (diene/cyclohexene/bicyclobutane). By allowing the reaction mixture to stir for 12 hours, the remaining bicyclobutane starting material was completely converted into the expected products (mostly into the cyclohexene). He then proceeded to expose a previously isolated bicyclobutane to the same reaction conditions. After 40 minutes, a mixture of the diene/cyclohexene/bicyclobutane was obtained and after 12 hours no more bicyclobutane was detected. Rather it completely converted to the cyclohexene. However, since the ratios between the 40 minute two trials were drastically different, Davies concluded that both mechanism were occurring. He did state that, based on the ratios, direct conversion of the starting material to the cyclohexene is faster than decomposition of the product (which is in line with the necessity for short reaction times). After reading a previous post on BRSM, I too have added some new chem blogs to the list of links —–>, Hope you enjoy them, as I certainly did! Put A Ring On It…Or Two! As promised, I have a review for today, the last one of 2012! I was all set to go trap shooting with my brand new shotgun with my best friend today but unfortunately mother nature had other plans. Since I’m all snowed in here, I figured there was no better time to do a review! Not much has changed in the few days since my last post with the exception of some new ChemSpider posts (Oxidation of CF3 Alcohols by an Oxoammonium Salt, Oxidation of a Propargyl Alcohol with an Oxoammonium Salt, and Synthesis of a CF3 Ketone via Trifluoromethylation of a Weinreb Amide). Go check them out! They are all based on our recently published work so I hope you enjoy them. After spending a good hour or so looking through my favorite journals and catching up on many excellent articles I missed, I decided to go with an easy pick by a legendary chemist, Samuel Danishefsky. While I’ve never had the formal pleasure of meeting Professor Danishefsky, I have seen his laboratory while I was down at Columbia. He certainly has a nice set-up down there. Moreover, as the director for the Bioorganic Chemistry Laboratory at Sloan-Kettering Cancer Research Institute, much of his work is directed towards targeted syntheses . In fact, my former graduate student adviser at Columbia (who came to my talk at the ACS conference in Philadelphia!) currently works as a NIH post-doc at Sloan under Professor Danishefsky. While much of Danishefsky’s work centers around total synthesis, he is no foreigner to methods development. I’ve said it before but I will say it again: the best way to figure out where methods are sorely needed is by conducting a targeted synthesis. It’s quite clear that Danishefsky knows this concept quite well. Danishefsky is most famous for his named diene which has seen widespread usage because of its highly regioselective additions in Diels-Alder reaction. On a related note, Danishefsky has recently been exploring the Diels-Alder of chemistry of an interesting dienophile, cycloalkenones. Specifically, he has been focusing on cyclobutenones as coupling partners both in the inter– and intra-molecular sense. This new area of research the Danishefsky group is pursuing is part of a more general strategy to promote pattern recognition analysis (PRA). PRA provides an interesting alternative to Corey’s strategic bond-oriented retrosynthetic approach to total synthesis. PRA takes more of a building block approach and hence the key to PRA is having a diverse array of “templates”, or core motifs as he calls them, to build off of. 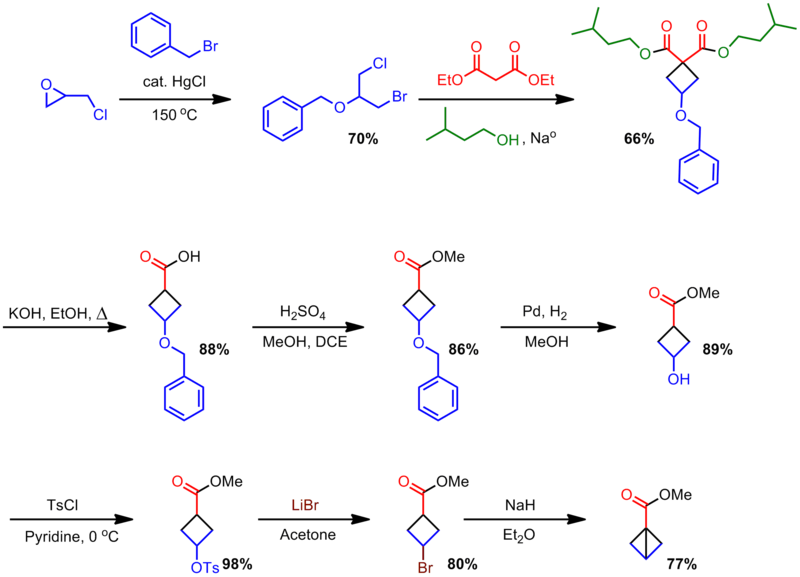 Danishefsky’s explorations in cyclobutenone chemistry have proven quite successful in diversifying the available templates. However, there is always room for improvement in any type of chemistry. Seeking to “enhance the synthetic value” of cyclobutenones, his attention turned to 2-halocycloalkenones. Having developed a reliable route to synthesize cyclobutenone, preparation of its 2-bromo derivative was quite easy. Treatment with molecular bromine followed by an E2 elimination affords the vinylic bromide in 67% overall yield. As a side note, I was quite curious about cyclobutenone. Surprisingly, or maybe not surprisingly, it’s not all that stable and readily polymerize at room temperature. It can be stored neat at -78 oC for a very short period of time but apparently can be kept as a stock solution in deuterated chloroform for much longer. I was also surprised that it was not until 1971 that it was definitively synthesized by Sieja and, even after it was synthesized, the chemical community paid little attention to it. To me, being a classical physical organic chemist, I thought this was somewhat of a travesty considering the interesting properties such a strained molecule must have! After preparing his model 2-halocyclobutenone system, Danishefsky then began his investigation of it ability to serve as a dienophile. He was delighted to find that using a variety of dienes he could obtain excellent yields of the corresponding bicyclic (or in one case tricyclic) adducts. Moreover, the reaction was diastereospecific, producing only a single pair of diastereomers. He was even able to produce a facile reaction with Dane’s diene. Using 2-bromocyclobutenone, strictly the “meta” product was obtained in excellent yield. Additionally, the reaction was complete in only two hours at room temperature! During the course of the reaction, the double bond undergoes an unusual migration to become tetrasubstituted. No explanation for how this migration occurred is given, though my guess is that the isomerization reaction is low enough in energy (and produces the more thermodynamically stable alkene) that it can occurs spontaneously. So what do you think? What are your thoughts on this peculiar product? 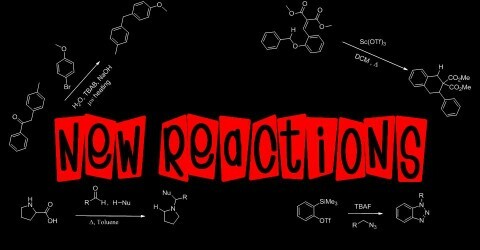 Back by popular demand…New Reactions Returns! It has been a long seven months since my last post and for that I must apologize. You see life has a funny way of getting very complicated very fast. Let me give you a summary of the events that occurred in my world over the past few months. 1. Near the end of October, my father passed away after a two and a half year battle with lung cancer (non-smoker, living only 58 years). I’ve been spending a lot of time with my mom trying to help her out as best I can. 4. I successfully submitted and defended my general exam. I am now a Ph.D. candidate! 5. Dr. G. K. S. Prakash visited UConn as part of the PLU-sponsored seminar series. He gave an excellent talk and I was so happy to meet one of the leaders in organofluorine chemistry!! A lot of planning went into his visit. 7. We are currently working on a collaboration with Vapourtec for a educational series flow unit. 8. Our group attended the ACS national meeting in Philadelphia in August. There we meet up with one of our former undergraduate student and had an amazing time! So as you can see, life essentially wanted all of my time. Anytime I tried to sit down and write a post I was interrupted and, rather than putting out poor posts, I decided to let the waters calm a bit. This week, I have taken time off to be with my mom on this first Christmas without my father. It has been rough for us but we’ve managed to make it a decent Christmas. Now that my house is quiet and I have far less to do than over the past seven months, I finally can sit down and just read the literature and return to posting. Rather than doing a new article, I figured I could go through our two articles that we published and then in my next post begin again fresh. So…what did we do? In the first of the articles is the work I did with DiAndra on a one-pot route to TFMKs. The idea for this project came to me one day after reading a review on TMS-CF3. The review stated that to date, TMS-CF3 had not been used constructive manner for an acyl substitution reaction with amides. I was kind of surprised to find this because of the several successful reports of ester displacement. However, at the same time, it kind of made sense. Even if the nitrogen species was displaced, it would likely add right back into the electrophilic CF3 ketone. Thinking to basic organic chemistry, I pondered whether Weinreb amides (which have been immensely useful in constructing ketones via with Grignard reagents) would be suitable candidates as leaving group. In more general terms, I wanted to see if any amide, even a reactive one, could be used to construct TFMKs directly. So DiAndra and myself began exploring the feasibility of this reaction. We hit immediate success with the simplest system, a phenyl Weinreb amide. By GCMS analysis we found that we had complete conversion to the TFMK. However, conversions are always deceptive and apparently the heat of the injector decomposed an unbeknownst to us intermediate When we attempted isolation by our traditional method we obtained very little TFMK. Thinking that our low yield was due to the volatility of this compound, we switched to a p-t-butyl phenyl system. Again, after workup we obtained low yield. Examining the crude reaction mixture by NMR revealed the presence of a silylated intermediate. However, as we monitored the stability of this species in THF, we found that it would slowly revert back to the starting material. Fortunately if cleaved rapidly, we could obtain substantially more CF3 ketone product. Still, yield was lacking. I then suggested that rather than go for the TFMK, let’s optimize the reaction for the silylated intermediate. Sure enough we found that, using toluene as the solvent and CsF as the fluoride source to initiate the trifluoromethylation process, we could obtain near quantitative conversion and excellent yield of the silylated intermediate. Yes, we could in fact isolate the intermediate!! We then focused on cleavage conditions. This took a bit a work and I’ll spare you all the details. We found that heating the reaction mixture to 50 oC in the presence of TBAF in THF and H2O we could successfully convert the silylated intermediate to the TFMK product in good yield (81% for the p-t-butyl). With this two-step, one pot protocol hammered out, we moved on to a substrate screen. We found that this reaction had a reasonably broad scope, with some exceptions. Ortho-substituted arenes and straight chain systems with significant alpha branching failed to convert to the desired intermediate. Beta branching was less of a problem but did lead to lower yields. We attempted this to a steric requirement by the reaction rather than an electronic rational. My current theory is that there is a necessary chelation of TMS-CF3 by the amide Weinreb amide which is decomposed by the addition of fluoride. In some substrates, either the chelation is too poor or the activation energy for complex formation is too high and hence trifluoromethylation cannot occur. We also explored α,β-unsaturated Weinreb amides. Here another complication arose. While we could successfully convert to the silylated intermediate quite easily, we obtained low isolated yield of the TFMK product. This time we analyzed the crude cleavage mixture and found that in addition to the desired α,β-unsaturated TFMK we found another TFMK ketone product. This new product was the result of the Michael addition of the displaced N,O-dimethylhydroxylamine anion into the highly electrophilic alkene of the desired α,β-unsaturated TFMK. Luckily, this unwanted byproduct could be removed by column chromatography. And that’s about it. What I loved most about this reaction is the scalability. One of my biggest pet peeves is when papers publish reactions done on 0.1 mmol scale. To me that’s not practical other than to maybe a chemist performing a total synthesis. This reaction has been performed anywhere from 10 mmol to 60 mmol and could likely be performed on the hundreds of mmol scale. Additionally, we have recently made some modifications that have improved yields and reaction times which will be published in chemspider in the coming week or so. Moving on to the next article, we have a more traditional approach to TFMK construction via the oxidation of their corresponding carbinols. Not surprisingly, we attempting to do so via our favorite oxidizing agent in the Leadbeater lab, Bobbitt’s salt. To date no reports of oxidation of these difficult-to-oxidize carbinols via an oxoammonium salt have been reported. TEMPO-based methods have been reported but these protocols use aqueous media in their reaction conditions. While this is not normally a problem for traditional ketones, trifluoromethylketones have the nasty habit of hydrating in aqueous systems, particularly in basic conditions (and TEMPO oxidations are conducted under alkaline conditions). The only reliable method for oxidizing these carbinols that is currently known is the use of Dess-Martin periodinane. While I LOVE DMP, it is insanely expensive and making it in-house is…difficult…to say the least. Therefore, we set out to attempt to use Bobbitt’s salt to oxidize these alcohols. However, using the traditional conditions (DCM, SiO2, Oxidant) no reaction occurred. The putative hydride transfer from the α-carbon was likely too high in energy because of the resulting destabilized “electron-deficient” carbocation. After some discussion with Dr. Bobbitt, we attempted to use the newer, basic conditions for our oxidation. According to Bailey and Bobbitt, the presence of a base dramatically alters the reaction mechanism. The change in reactivity results from a tightly bound ion pairing between the now formally deprotonated alcohol and the salt. This enables a more facile hydride transfer. Note that by “formally deprotonated”, I mean that there is a much greater percentage of the alkoxide in solution than under neutral/slightly acidic conditions. The bases we use, pyridyl bases, can most certainly not deprotonate the alkoxide irreversibly. We were pleased to find that under basic conditions, we could obtain quantitative conversion to the desired ketone and isolated yield. We found that as we increased the basicity of the base, the rate of the reaction increased (e.g. 2,4,6 collidine reacted faster than 2,6 lutidine) However, for in an effort to balance ease of purification with timely oxidation, we chose 2,6 lutidine over pyridine and 2,4,6 collidine. Once we had optimal conditions, we move on to oxidizing a variety of carbinols. Aryl substituted, alkenyl, and propargyl CF3 carbinols all oxidized easily and in good yield. However, under our original conditions aliphatic CF3 alcohols failed to oxidize. To circumvent this problem, we chose to use 1,5-diazabicyclo(4.3.0)non-5-ene (DBN) as the base to formally deprotonate these alcohols. This resulted in a rapid, mildly exothermic reaction and smoothly converted the aliphatic species to TFMKs. Due to degradation of the base by the oxidant, not only was more salt required for complete conversion but more extensive purification was needed (e.g. vacuum distillation). Therefore, while it can be done with these compounds, this method likely isn’t the optimal way to oxidize CF3 alcohols lacking a neighboring sp or sp2 center. By taking advantage of the fact that the oxidant will not react with CF3 carbinols unless under basic conditions, we can selectively oxidize the non-CF3 alcohol. We can then oxidize the CF3 alcohol using our optimal conditions. Now I know what you are going to ask, what happens if you oxidize the diol under basic conditions? Unfortunately there is no selectivity; you get a mix of oxidation products. Finally we conducted a simple rate study to get a idea of the relative rate of oxidation. We used the convenient method of Mullet and Nodding to obtain kinetic data. From there we used one of our aryl systems as our base line for the rate of oxidation. We found that the more extensive the conjugation, the fast the rate. Interestingly this was not the only factor. The propargyl CF3 system we studied oxidized extraordinarily fast (120 times faster!) indicating to us that a steric component to the oxidation was present as well. Therefore, we suggested that, in addition to cation stability, the combined electronic repulsion by the highly electron-rich CF3 group and the steric repulsion by any β-substituent contribute significantly to oxidant/alcohol complexation and hence successful oxidation. Again what I like most about our method is it’s scalability. You can perform these oxidations on any size scale. Moreover they are colorimetric. Prior to addition of the pyridyl base, the reaction will be bright yellow from the oxoammonium salt. After the base is added the reaction will transition from yellow to orange to finally deep blood red. This red color typically indicates reaction completion. Finally, you can recover the spent oxidation and reuse it to make more salt! And suddenly fluorine…all of it! Methyl 2,2-Difluoro-2-(fluorosulfonyl)acetate, a Difluorocarbene Reagent with Reactivity Comparable to That of Trimethylsilyl 2,2-Difluoro-2-(fluorosulfonyl)acetate (TFDA) Eusterwiemann, S.; Martinez, H.; Dolbier, W. R., Jr. JOC ASAP May 21, 2012. After a long hiatus, I have finally returned to the world of chemistry blogging. These past two months have been some of the busiest of my graduate career thus far. After my tetrahedrane guest post on BRSM, I really stepped-up my chemistry game trying to finish up the three project that I am currently involved in. Two of these three should be ready for submission very soon and the remaining one should be complete by summer’s end (at least that’s my expectation right now). We manage to get another publication, a flow paper in OPRD in April. It was more technically oriented so it fit better in OPRD than in a more organic journal like Org. Lett. With the semester ending, I am finally officially done with class for the rest of my life (at least for required class, I presume I will take classes of my own volition in the near future *cough* pistol permit safety class *cough*). With this complete, I will have even more time to do research in the fall. Speaking of the fall, rumor has it we may have an exciting speaker coming to UConn to give a talk next semester, Dr. G. K. S. Prakash! I would be very happy to get a chance to talk with the guy whose lab helped develop one of the most powerful trifluoromethylating reagents known, TMS-CF3. Speaking of TMS-CF3, I’ve put up a bunch of procedures (including one using TMS-CF3) up on Chem Spider Synthetic Pages (Paal-Knorr Pyrrole, KBH4 Reduction, [2+2] Cyclobutanone Synthesis, Finkelstein TMS-CF3) so go check them out! The graduate student conference in Buffalo, the CGSS, went quite well. The Leadbeater group all had great posters and presentations. It was my first time to Buffalo and I ended up really liking it there. We all meet some cool people (including DiAndra’s former boss at Niagara University, Dr. Ronney Priefer) and saw some excellent presentations (especially by one of the key note speakers, Corey Stephenson from BU). I’m really looking forward to our next conference, the ACS meeting in Philly in August. All of the talks and posters submitted by our group have been approved so we will all be going. With the end of classes and the beginning of the summer, I’ve had far more time for research. Its also nice to get out of work feeling like I accomplished light AND its not pitch black out. We have several students in our lab for the summer, one from CCSU, one from UConn, and a Stonehill Student that was sent by Dr. Tilley. They all seem excited to start doing research but they all require a bit of training. Everyone in the lab has been pitching in to get them trained up. Unfortunately though, while gaining some people, we are also losing DiAndra. She is off to Boehringer Ingelheim (BI) for the next part of her Master’s in synthetic organic chemistry. Her internship at BI could possible lead to a job there. I hope she really enjoys it there and I know she will own. She won’t be all that far away either…the BI research plant is in Ridgefield Connecticut and after she’s done there she will return in the fall to finish her thesis and defend. Considering that I have no experience with industry, I am currently looking into the possibility of getting an internship there for the summer of my third year. BI and UConn have a great relationship and many students have done that sort of thing in the past. An internship like that may swing me towards industry or academia but I think you’ve heard enough about my life now though :P, let’s get to the chemistry. Palladium-Catalyzed Substitution and Cross-Coupling of Benzylic Fluorides by Brown and Gouverneur detailing a remarkable C-F bond-breaking method (a transformation which is not very common, although benzylic fluorides are somewhat reactive). This article was also featured on Synthetic Remarks! Synthesis of Indolines, Indoles, and Benzopyrrolizidinones from Simple Aryl Azides from the Renaud group which demonstrates how a radical cleavage of a C-I bond mediated by Et3B and O2 in the presence of an alkenyl azide can induce cyclization. The fluoride byproduct, which would likely interfere with free carbene formation, can be trapped with TMS-Cl. Initial runs using this system did in fact give promising results. However, high temperatures and minimal solvent were necessary. As Dolbier notes, this temperature requirement is very similar to both Prakash’s method and the TFDA method. Solvent, while minimal, needed to be somewhat good at dissociating the KI (used as the I- source). Hence a mixture of dioxane and diglyme was chosen. This was also advantageous because it provided a good thermal cushion. It was later found that 2 equiv of MDFA was required as compared to the substrate. 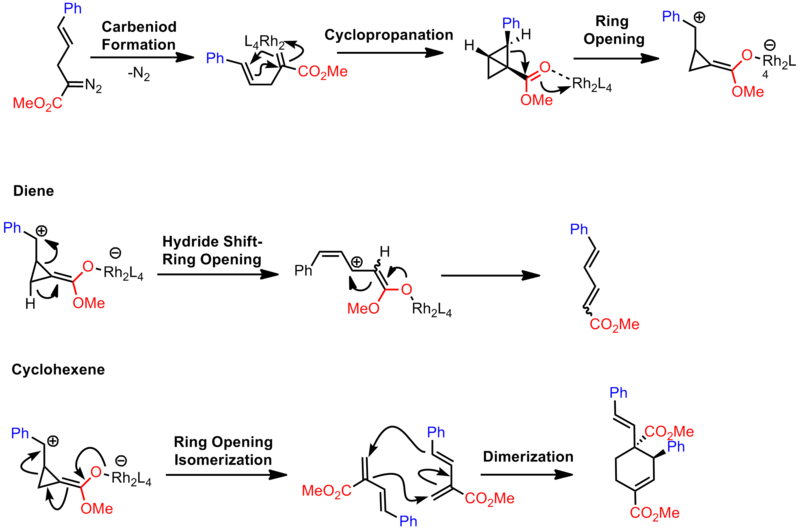 After the tedious process of optimization was accomplished, Dolbier demonstrated that this system, while somewhat harsh, enable difficult-to-react alkenes to undergo cyclopropanation in good yield. In fact, it was later revealed that a much less Lewis-acidic trapping agent hexamethyldisiloxane could be used as an alternative trapping agent, though this required extended reaction times. While this article was short and many of the yields are solely by NMR, I still really enjoyed this article because of the complexity of the transformation. There’s a lot going on in the reaction flask so I’m kind of surprised how well the reaction does in fact work. In a sort of up-and-coming field, we have article featuring electrophilic trifluoromethylation. The two leading reagents have kind of set the standard for electrophilic trifluoromethylation. Togni’s reagent(s), which uses a Dess-Martin-like hypervalent iodine architecture, is commercially available (though it is expensive) and have become quite popular even though they are less than 10 years old. The other older reagent system, whose popularity is increasing, is those based off of Umemoto reagent. These are O-(trifluoromethyl)dibenzofuranium, (Trifluoromethyl)dibenzothio-, seleno- and telluro-phenium salts. They rely on the principle of attaching the CF3 group to a formally positive heteroatom to make it electrophilic. I personally am a fan of the Togni system mostly because I like hypervalent iodine. How often do you see a halogen with that many bonds to it that has some synthetic utility? With the exception of the Dess-Martin reagent itself and a few other chlorine examples, there pretty much are none. In this latest paper, Togni at ETH Zürich reports on a method to trifluoromethylate azoles using his 2nd generation reagent. As you probably know by now from reading the various post on my blog, adding fluorine into a molecule (whether it be via a CF3 group or a simple fluorine atom) is pretty popular in medicinal chemistry. Not only does it (usually) increase the ability of a molecule to penetrate cellular membranes but it can serve as a bioisostere. Bioisosterism is the capacity of substituent with similar sizes or shapes to be interchanged with others without substantially altering biological behavior, i.e. binding affinity. Many drugs have exploited this principle and Togni acknowledges this by citing the powerful antibacterial agent norfloxacin and Ciprofloxacin as an examples. The paper Togni cites, by Asahina of Kyorin Pharmaceutical Co., states that the N-CF3 compound is comparable to that of a simple methyl group with respect to the antibacterial properties and on par with the with activity of norfloxacin for most species of bacteria. With that in mind, this paper is kind of a follow up work which I really like. 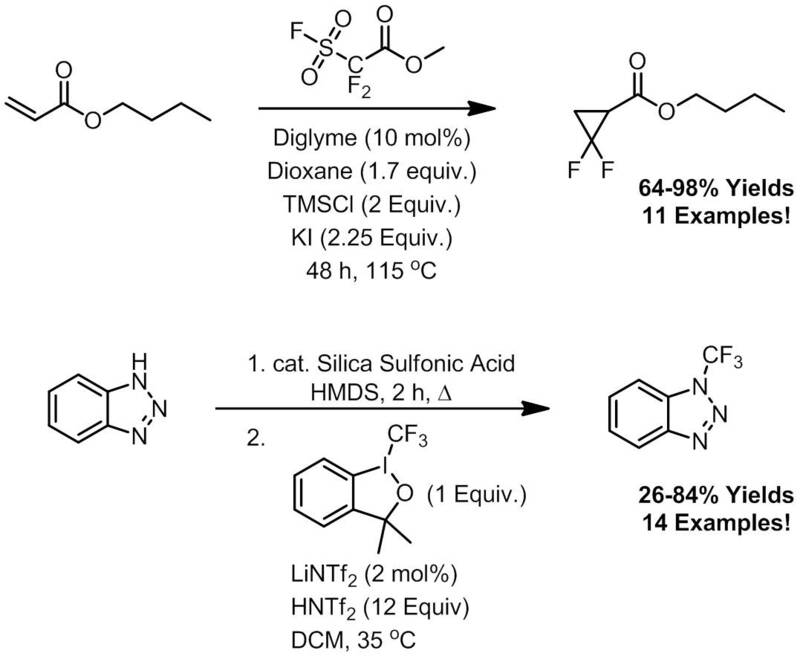 Basically Togni’s group observed the formation of a N-CF3 triazole compound attempting to make trifluoromethyl imines from azoles by way of a Ritter-type reaction. While only a side product, knowing that there were limited methods for accessing this class of compounds, Togni decided to optimize the reaction to yield this as the major product. Now here’s another interesting part about this article: the discussion of the results from their study (yields, how they characterized their products by some fancy 19F-NMR techniques) came before their optimization of reaction conditions. I think this was something that a reviewer may have wanted them to add in after the fact but its quite extensive. Much of the focus was on solvent, temperature, Lewis acid catalyst choice, and concentration. In fact they did a good deal of reaction monitoring to assist in some finer details of the conditions (i.e. silylating the nitrogen just prior to conducting the reaction rather than storing it and adding LiNTf2 into the mix as a “less Lewis acidic fluoride scavenger”. Overall, work was done quite thoroughly and didn’t leave me with much in the way of questions, which is something I love see.